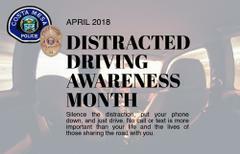 COSTA MESA, Calif. – The Costa Mesa Police Department (CMPD) will join law enforcement throughout the state to step up enforcement and awareness efforts by the California Office of Traffic Safety (OTS) to discourage distracted driving. Officers will have a special emphasis this month on enforcing all cellphone and distracted driving laws. The goal is to increase voluntary compliance by drivers, but sometimes citations are necessary for motorists to better understand the importance of driving undistracted. Drivers are using their cellphones less often while driving, 10 years after “hands-free” became the law, but distracted driving still remains a serious safety challenge in California. Observing April as Distracted Driving Awareness Month and the first week in April as California Teen Safe Driving Week, safety advocates will focus on education and enforcement efforts statewide. April 5, and April 13, have been designated as the two statewide enforcement dates when law enforcement agencies will step up distracted driving enforcement activities. The California Department of Transportation will put distracted driving messages on the changeable message signs on freeways all this month. This month, CMPD will be deploying extra traffic officers with grant-funded resources on several specific dates in city locations with higher numbers of traffic collisions. Violators will be stopped and cited with fines set at $162 for first-time offenders. This campaign is funded by a grant from OTS, through the National Highway Traffic Safety Administration. Traffic officers have issued hundreds of thousands of citations over the past three years to those texting or calling on a hand-held cellphone. Recent legislation now makes it illegal to use your smartphone’s apps while driving. Still, everyone has seen other drivers on a device while driving in a dangerous manner next to them during a commute or a trip around town. -	If you receive a text message or need to send one, pull over and park your car in a safe location, but ‘never’ on a freeway. Once you are safely off the road, it is safe to text. -	Designate your passenger as your “designated texter.” Allow them access to your phone to respond to calls or messages. -	Do not engage in social media scrolling or messaging while driving. -	Cellphone use can be habit-forming. Struggling to not text and drive? Put the cellphone in the trunk or back seat of your vehicle until you arrive at your final destination.